Looking for large groups cabins in the Smoky Mountains? Whether you are planning a wedding, family reunion, business meeting, or church retreat, our 7 bedroom Gatlinburg cabin rentals are an excellent choice! Our large group cabins can comfortably sleep as many as 28 guests. Ensure that everyone in your group has the space and privacy they need to enjoy the Smokies. With spacious accommodations, our large cabins in Gatlinburg, TN and the Smoky Mountains can serve as excellent venues for any occasion. When you book a seven bedroom cabin in Gatlinburg, you save your group a lot of trouble. By finding lodging for the whole group in one place, you cut down on the confusion and stress for everyone involved. Group cabins do simple things like giving your party a central meeting space to make your gathering fun and meaningful. Even better, your 7 bedroom cabin rental in Gatlinburg can ensure that your whole group is able to spend quality time with one another. This is a must for large family gatherings and occasions for reconnecting in the beautiful Smoky Mountains! These spacious log cabins enjoy great locations. After all, these are Gatlinburg cabin rentals near Dollywood and the Pigeon Forge Parkway. With dozens of attractions, restaurants and shopping only minutes away, your group can make the most of their vacation. Stay close to what you want to see when you visit the Smokies! On top of fun and relaxing amenities, these rentals come with excellent Smoky Mountain views! While the kids work off some energy in the game room or at the swimming pool, the adults can relax on your cabin's wrap around porch. When you book online, you can expect to save 15% on your cabin! 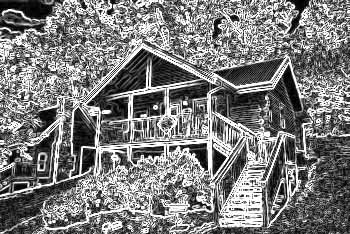 Be sure not to miss out on great vacation savings AND these beautiful Smoky Mountain cabins with quality amenities. If these seven bedroom cabins are too large for your group, we also offer 6 bedroom cabins. Need even more bedrooms? We also provide eight bedroom cabin rentals for your group's Smoky Mountain vacation! Come experience "Poolside Lodge," an impressive 7 bedroom cabin rental near Pigeon Forge with resort pool access, a private plunge pool, and a gas fire pit! Stay at a home theater cabin near Gatlinburg like no other! "Rocky Top Lodge" features a state of the art theater room, large DVD library, hot tub, and much more. Smoky Mountain cabin rental with pool access, hot tub, pool table, arcade and more! Cabins At The Crossing Resort 7 bedroom near Dollywood and Gatlinburg. Book "Alexander The Great" a group cabin in the Smoky Mountains near the Pigeon Forge Parkway. Enjoy your 7 bedroom cabin with pool access and room for 22 guests! "Smoky Mountain Lodge" is a beautiful 7 bedroom cabin rental that comes complete with a Theater Room, Resort Pool Access, and an air hockey table!